Sometimes I run across a recipe that seems to good to be true! And this is one of those recipes! How has something so delicious-sounding eluded me all my life? I have always adored peanut butter and chocolate together. Whoever invented that combination deserves a Nobel Prize as far as I’m concerned. The fact that I have never tasted these little morsels before….well, it’s simply unacceptable and must be remedied….immediately! 1. Preheat oven to 350 degrees. Spray or grease 40 mini-muffin cups. 2. Prepare boxed brownie mix as directed. Spoon batter evenly into muffin cups (about 3/4 full). Bake for 13-15 minutes or until top is set and a toothpick inserted into center comes out slightly wet. After brownies are out of the oven, wait for centers to fall. This will happen upon cooling. If not then tap the centers with the back of a teaspoon to make a hole for the peanut butter. 3. Place peanut butter in a small microwave-safe bowl. Microwave on high for 45 seconds then stir. 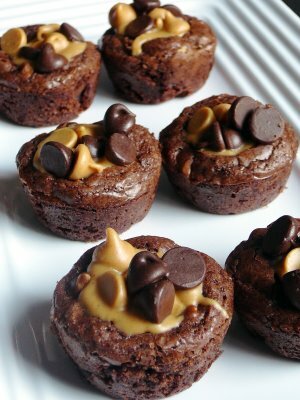 While brownies are still warm spoon about half a teaspoon of peanut butter into the center of each brownie. Top with semi-sweet chocolate chips and peanut butter chips. Cool completely in pan. 4. Indulge with a tall glass of cold milk. Posted on August 16, 2012, in Lady Fab Cooks and tagged brownie mix, brownies, chocolate chips, dessert, food, peanut butter, peanut butter chips, recipe, sugar fairy bake shoppe. Bookmark the permalink. 5 Comments. Those would be perfect to bring to a tailgate party. Yes they would. I’m sooo glad that football season is here. Roll Tide! We lived in Birmingham for 9 years, we love Bama! Oh Wow! Well I was born and raised in Alabama but we live in Florida now. My husband God Bless him is a Auburn fan. We are more like a family divided than house divided. But it just makes it all the more live when game time comes around. Reblogged this on Latoya Seignious Posts.